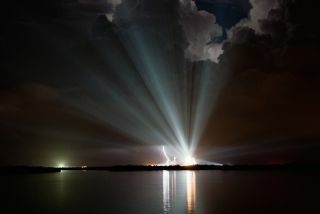 CAPECANAVERAL, Fla. - NASA will take another shot at launching the space shuttleDiscovery on Wednesday after unexpected thunderstorms foiled an attempted liftoffearlier today. Discoveryand its seven-astronaut crew are now slated to blast off at 1:10 a.m. EDT (0510GMT) to begin a 13-day trek to the International Space Station. The astronauts werealready aboard the shuttle when NASA calledoff their launch early this morning. Thunderstorms,rain and lightning were all concerns at different times during the attemptedlaunch. ?Bad luck,but not too disappointed,? said Swedish astronaut Christer Fuglesang, aDiscovery mission specialist, in a Twitter update. ?Try again tomorrow!? Fuglesang,who represents the European Space Agency, has been posting Twitter updates inEnglish and Swedish under the moniker @CFuglesang during his mission trainingto reach out to the Swedish public. Likewise, his fellow crewmate JoseHernandez of NASA is also ?tweeting? in English and Spanish as @Astro_Jose. Hisfirst post after the delayed launch was also optimistic for Wednesday?s launchchances. Discoveryhas a 70 percent chance of good weather at launch time Wednesday morning, aswell as for fueling later this afternoon, said Air Force Lt. Col. PatrickBarrett of the 45th Weather Squadron that watches over shuttle flight weatherfor NASA. Engineers plan to begin fueling Discovery?s 15-story external tank atabout 3:30 p.m. EDT (1930 GMT). ?I think we?restill going to have similar challenges,? Barrett told SPACE.com. Discovery hadan encouraging 80 percent chance of good conditions before thunderstorms rolledin to spoil Tuesday?s launch attempt. Barrett told SPACE.com after the scrubbedlaunch try that some of the same weather patterns that led up to the stormdelay today could arise for Wednesday?s attempted liftoff. Commandedby veteran shuttle flyer Rick Sturckow, Discovery?s six-man,one-woman crew plans to deliver a cargo pod packed with new science gearand supplies to the space station, as well as a new treadmill named after comedianStephen Colbert. Colberttried to get a new space station room named after him earlier this year byurging fans of his Comedy Central show ?The Colbert Report? to vote for him inan online NASA poll.? NASA ultimately chose the name Tranquility, after firstmoon base set up by astronauts during the Apollo 11 mission in 1969, but dubbedthe space station?s new treadmill after Colbert as a consolation prize. Thetreadmill is known as COLBERT for short, but its full NASA name is the CombinedOperational Load Bearing External Resistance Treadmill. NASA invited Colbert towatch Discovery?s launch but he was unable to attend. He did, however, sendNASA a video message that once more lamented his loss of the Tranquility module?snaming rights. ?You namedthe node ?Tranquility.? Yeah, that?ll scare the aliens. They?re not going tomess with Earth now! We might get all relaxed at them,?? Colbert said in thevideo. ?But I was still honored to receive the traditional NASA consolationprize, a space treadmill.? Threespacewalks are planned for Discovery?s mission to replaceexperiments outside the space station and replace a massive cooling systemtank that weighs as much as a small car. Let to rideto space aboard Discovery with Fuglesang and Hernandez are shuttle commanderRick Sturckow, pilot Kevin Ford and mission specialists Patrick Forrester,Danny Olivas and Nicole Stott. Stott will replace NASA astronaut Tim Kopra aspart of the space station?s six-person crew. She is due to return to Earth inNovember, while Kopra - who has lived aboard the space station for more than amonth - come home on Discovery. NASA has until the end of August to launch Discovery before running intopotential space traffic conflicts with Japan?s first unmanned cargo ship and aRussian crew-carrying Soyuz spacecraft, both of which are due to launch towardthe station in September. IfDiscovery does not liftoff by Aug. 30, NASA may have to stand down to wait outthe September flights, delaying its own mission to Oct. 17, mission managershave said. SPACE.comis providing complete coverage of Discovery's STS-128 mission to theInternational Space Station with Managing Editor Tariq Malik in Cape Canaveral,Fla. Click here for shuttlemission updates and a link to NASA TV. Live launch coverage begins at 8 p.m. ET(0000 Aug. 26 GMT).